After being institutionalized for a large part of her youth, Susan Wise became interested in crafts in a vocational training program. For more than two decades, Wise has explored and mastered numerous craft forms – quilts, embroidery and ceramics. But Wise’s true masterworks are baskets. Unlike traditional basket making, which uses a very regimented math to tightly and firmly weave the materials, Wise has invented her process. She first lays out the twine or rope and begins shaping it into the vessel, and the, using a different diameter of string or yarn, lashes the coils into place. Characteristic of Wise’s vessels are their emphasis on biomorphic forms and shapes. 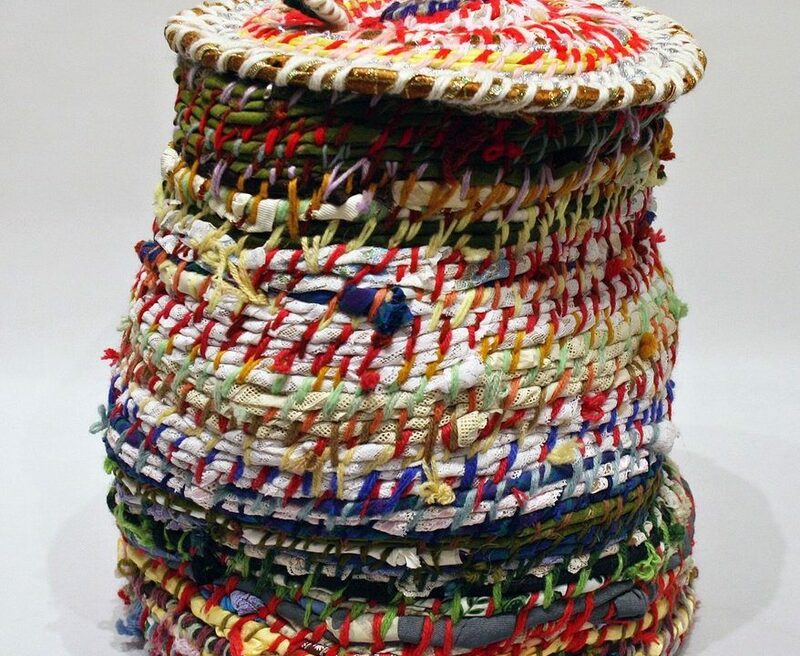 Through her use of color and materials (hemp twine, various ropes, threads and fabric scraps), her baskets often seem to undulate and sway to an invisible rhythm, while frequently seeming to be collapsing under their own weight as if exhausted by their dance.